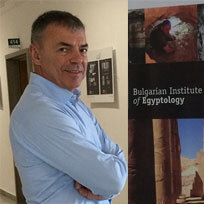 Prof. Ignatov is an Egyptologist. His scientific interests lie in the field of linguistics, history and religion of ancient Egypt. He defended his PhD degree in history at Saint Petersburg State University. In 1993 and 1995 he specialized in All Souls College, Oxford. Professor Ignatov is a lecturer at St. Petersburg University, Santiago de Compostela, the Russian Institute of Egyptology in Moscow, world congresses and seminars on Egyptology in Turin, Cambridge and Cairo. His academic career started at St. Kliment Ohridski University, where he was successively a lecturer (1985), assistant (1991) and associate professor (1996). At New Bulgarian University Professor Ignatov was Head of Mediterranean and Eastern Studies Department (1998) and Dean of the School of Undergraduate Studies (1999). Prof. Ignatov is a founder of the Bulgarian Institute of Egyptology at NBU and its Department Chair since 2006, Vice President of the International Association for Ancient Oriental Studies, International Associassion of Egyptologists (1985), member of the Egypt Exploration Society, Great Britain (1993), Russian-German society for studying ancient world’s cultural inheritance (1989). Prof. Sergei Ignatov, D.Sc. has been a member of the Board of Trustees at NBU since March 25, 2013. Prof. Ignatov was Minister of Education and Science over the period 2009-2013. Some of his most significant reforms are the following: winding-up the Higher Education Attestation Commitee, granting broad autonomy to universities and introducing differentiated funding, adopting a research strategy, adopting a youth law and strategy, and introducing student loans. Prof. Sergei Ignatov, D.Sc. has more than 40 scientific publications in journals issued in Sofia, London, Cambridge, Cairo, Turin, Santiago de Compostela, St. Petersburg and Moscow. He is the author of The Morphology of Classical Egypt, The Wisdom of the Ancient Egyptians, Egypt of the Pharaohs, Papyrus does not grow on a rock and The Body of God.